Mobile Websites are an absolute MUST. It’s easy to see why when we consider that searches done with mobile devices (smartphones and tablets) have now overtaken searches done with laptop or desktop computers. The most-used website on the plant – Facebook – reports that 65% of it’s users ONLY access it with a mobile device. The real killer is that when they are searching for a local business, so many of them actually actually phone the business. Will they find your site in a search, then leave because it doesn’t work properly on a mobile device? (Hint: Flash-based sites don’t work at all on an iPhone or iPad!) Can you afford for them to be calling your competitor? Better to ask us to create a mobile site for you – from a simple contact page with tap-to-call, “live” map directions (drive or walk from where they are) to your business, and a short response form like an opt-in for your SMS marketing we can also manage for you 🙂 – to a complete mobile website that showcases your business and can include coupons, time-limited offers etc. 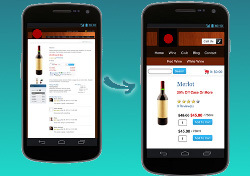 A mobile site will operate in parallel with your existing site. Watch this short video (less than 2 minutes) to see what we mean… then look at the list below the video, and call us on one of the numbers below or use the contact form on this page.